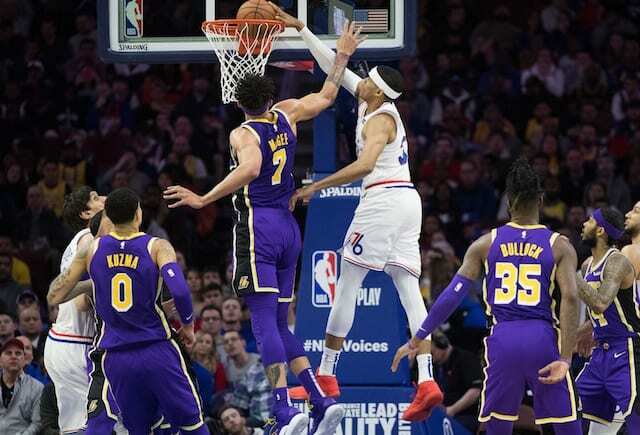 Kyle Kuzma finished just short of matching a career high with 39 points but the Los Angeles Lakers failed to contain Joel Embiid in a 143-120 loss to the Philadelphia 76ers. Facing a 76ers team that features size throughout their starting lineup, the Lakers made an adjustment by replacing Rajon Rondo with newly-acquired Reggie Bullock. The change was overshadowed, however, as Kyle Kuzma exploded for 23 points in the first quarter. It was the most points in the first quarter by a Lakers player since Kobe Bryant also had that many in first 12 minutes of the final game of his career. Meanwhile, the Lakers’ 40 points were a season high for a first quarter. However, the hot start didn’t amount to much by way of a lead as the Lakers allowed 39 points. 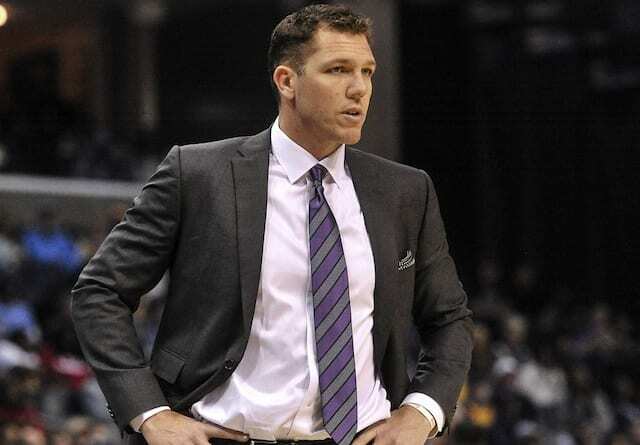 That was much to the dismay of head coach Luke Walton, as he stressed a need to improve defensively leading into the game. Whereas Tobias Harris carried the 76ers with 15 points in the first quarter, Embiid helped spark an 8-2 run to open the second. The Lakers managed to erase their deficit and reclaimed the lead on JaVale McGee’s basket just over midway through the quarter. Their offense then grew a bit stagnant, and Embiid and J.J. Redick helped the 76ers open a nine-point lead by halftime. As their deficit swelled to 12 points in the third quarter, the Lakers responded with a 6-0 run. 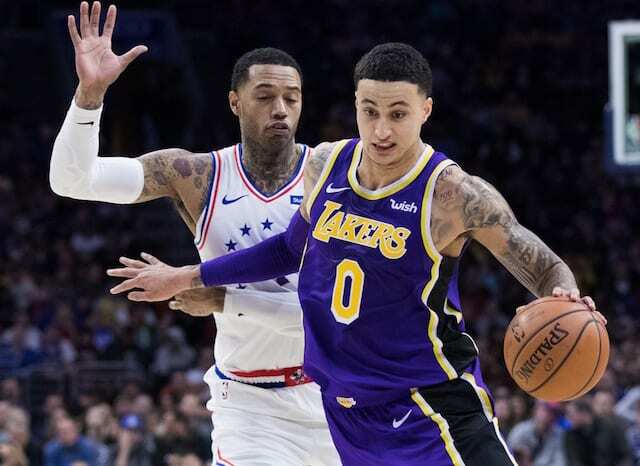 Kuzma then overcame a personal scoring drought to cut the 76ers’ lead to just four points. But the Lakers failed to slow Embiid and again fell behind by double digits. Philadelphia closed the third quarter on a 13-2 run to lead by 15 points entering the fourth quarter. 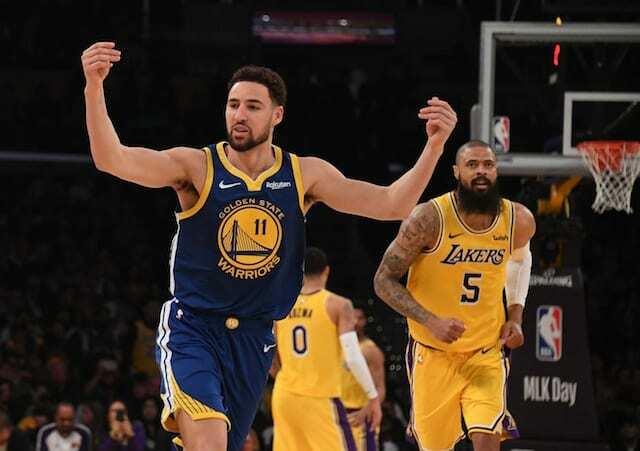 With Brandon Ingram, James and Kuzma on the the bench, the Lakers failed to generate much consistency on offense. James returned and made consecutive baskets to trim the deficit to 12 but it ballooned to 20 points before long. Embiid finished with a team-high 37 points.